Thank you for considering bringing your project to FIGMENT Oakland 2014 at Mosswood Park! This FIGMENT Oakland Artist Tips & Tricks Guide is designed to guide you through the construction, maintenance, installation and de-installation of your piece. FIGMENT is a forum for the creation and display of participatory and interactive art by emerging artists across disciplines. 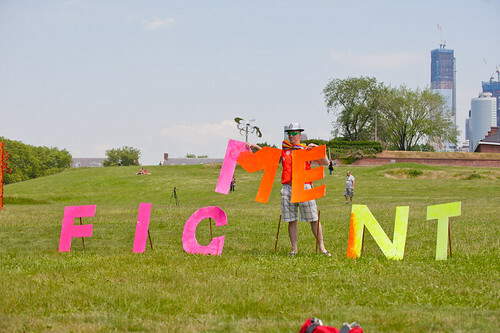 FIGMENT began in July 2007 as a free, one-day participatory arts event on Governors Island in New York City. Since then, FIGMENT has grown significantly each year—in number of projects, duration, participants, volunteers, exhibitions, locations, and public support. We seek to create an environment ripe for each individual to achieve personal artistic transformation… but the creation of such an environment can be done only through creative cooperation and collaboration. We are committed to leaving no physical trace of our activities wherever we gather. We clean up after ourselves to leave each place in a better state than we found it. We ask that you go to FIGMENT Artist Submission Portal and create an account to begin your submission process. This is your account to keep, so please document your username and password. You can incrementally save your project. This allows you, the artist, to begin a project proposal, and come back to it another day. Remember though, once you’ve clicked the “submit” button, you’ll no longer be able to make changes to that project. Submit your art project for FIGMENT Oakland by 11:59pm PST on September 30th, 2014, by filling out the entry form. The earlier you submit your project, the more personal attention you will get from our Curatorial Team! So please don’t wait until September 30th to apply! As soon as we have accepted your project, we will hook you up with one of our FIGMENT Team Curators. They will be your contact, your advocate and your advisor in the time leading up to and throughout FIGMENT Oakland. Limited electricity is available for installation and de-installation. Keep in mind that the closest outlet to your project will be over 100 feet away. Plan accordingly and bring your own extension cords and all tools necessary for install and removal of your piece. Power is available for selected FIGMENT artists who submit a project via our website by August 1st 2014 and coordinate with a curatorial contact. There will be limited indoor space. Please be prepared to submit any indoor project by August 1st, 2014. We’d prefer that you didn’t but limited stakes of no more than 6 inches can be placed in some areas of the park. Please check with your curator before staking. FIGMENT is an entirely free and non-commercial event in which everyone volunteers their time and effort to participate… the organizers, the artists, the participants. Everything at FIGMENT is free, nothing for sale, and no one insisting that you have to give a donation to participate. However, the event is powered by donations from the community so please donate if you can. Unfortunately we cannot cook or distribute food at Mosswood Park. We can, however, bring food for ourselves and our friends, i.e. a picnic. There are a few BBQ grills on site. Projects involving the distribution of pre-packaged, single serve food items (such as candy or snack crackers) will be allowed if the artist creates a plan for all packaging waste. There is no fire allowed at FIGMENT 2014. Chalk art is allowed in some portions of at Mosswood Park. If you are bringing chalk, please talk to your curator beforehand. Think modular design. It is important to consider the transport and final assembly of your project in the design. It is ideal to have practically ALL of the major construction completed before bringing it to the park. Projects should be created in pieces that are movable by a maximum of 4 people. Be sure to coordinate a crew for your installation / de-installation. FIGMENT is a unique art event in that all projects presented at the event must be participatory and interactive. Participatory art involves the participation of the audience in the creation of the work. We encourage artists who may work in more traditional ways to introduce a participatory element to their pieces for FIGMENT. - Create a new piece of work at FIGMENT and involve the audience in its creation – for example, painting or building. For more ideas, submit your project so that a curator can help make your idea a reality. Yes! Our event is completely volunteer run and we don't accept corporate sponsorships of any kind. But we do have very many various event costs to cover (such as porto-potties, for example) and we hope members of the community will donate to help our event happen. FIGMENT is a community-based event organized and run by volunteers. FIGMENT does NOT provide funding for the production, transportation, or insurance of works to, at, or from the park. FIGMENT encourages artists to apply for outside grants and fundraise for your project within your personal capacity. Please note that no corporate sponsorship (including logos and credit lines) is permitted at the event. In addition, nothing may be sold at the event. Arrangements must be made with the FIGMENT team for all deliveries, installations, and de-installations to or from Mosswood Park. Once you have submitted your project, you can speak about logistical needs in more detail with one of our curators or email oaklandcuratorial@figmentproject.org. Artists are encouraged to set up and break down their exhibits before and after FIGMENT, instead of during the event itself. The park will be open for project installation the morning of FIGMENT, from 7am to 10:30am. De-installation will take place from 5pm to 10pm the day of the event. We kindly ask that you do not sell anything – including CDs – at FIGMENT. FIGMENT is an entirely free and non-commercial event. Yes, you may collect addresses but we ask that you manage the list and make it clear to participants that they are signing up for your list and not the FIGMENT list. Will there be parking for my vehicle? There will be extremely limited parking for FIGMENT artists and volunteers. Please talk to your curator about your parking needs. Please make every effort to bring all the supplies that you need for your project. As an all volunteer event, we give our time and passion to the event, but it’s a bit more challenging to buy things. FIGMENT can help direct you to free, donated and low cost resources from which to source materials. Please get in touch with us for more information: oaklandcuratorial@figmentproject.org. We encourage you to bring projects that you can carry while walking to a public park. Projects will not be on our map or schedule, nor will unregistered projects have access to power. Please take your portable, non-registered project with you when you leave the park and leave no trace. FIGMENT is Saturday, November 8th from 11AM to 5PM. We recommend using public transportation. Please check with BART and AC Transit to plan your route. Can I borrow tables and chairs? No, please bring your own tables and chairs to the event. A: If it’s very very light, yes. But we cannot, under any circumstances, risk any damage to the trees. Think cloth – preferably no paper strings, since they will stick or leak color on any tree as soon as it starts raining. Please check with your curator before hanging anything from the trees. A: Yes, we can assign you a specific tree. We ask that you leave the booze at home.